Undoubtedly, you've heard about the benefits of moving funds from a traditional IRA into a Roth IRA, a conversion that can save money on future taxes. But there's a "toll" to pay for entering a Roth: The transfer of funds is subject to current income tax, plus it could trigger the 3.8% surtax on net investment income (NII). And that's just the tax cost at the federal level. Is it worth the price of admission? The only way to answer that is to crunch the numbers for your particular situation, but here are some guidelines to help you understand the basic trade-offs. Money you take from a traditional IRA, to the extent that it represents tax-deductible contributions to the account and investment earnings that have accumulated there, is taxed at ordinary income rates, currently topping out at 39.6%. And while IRA distributions themselves are exempt from the 3.8% surtax, they still increase your modified adjusted gross income, which is part of the calculation for determining NII. As a result, payouts from a traditional IRA could end up being taxed at a combined 43.4% federal tax rate. Moreover, you have to take annual required minimum distributions (RMDs) from IRAs after age 70½. In contrast, "qualified" distributions from a Roth IRA - taken after you reach age 59½, or because of death, or disability, or used for up to $10,000 in first-time homebuyer expenses - that you've had for five years or more are 100% tax-free. Other distributions may be wholly or partially tax-free under ordering rules that treat initial payouts as a return of your nondeductible contributions to the account. And money you keep in a Roth is exempt from RMD rules during your lifetime and won't be taxed if it's withdrawn by your heirs. One critical factor to consider in weighing whether to do a Roth conversion is your current tax rate compared with what you may pay in the future. For instance, if you anticipate being in a much higher tax bracket during retirement, it could make sense to pay the conversion tax now to avoid higher future taxes on distributions from a traditional IRA. 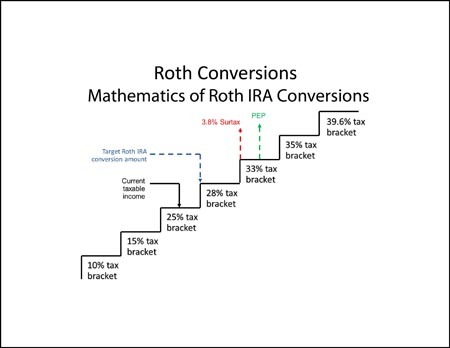 For many people, the "sweet spot" for a Roth conversion is the upper ranges of the 25% tax bracket (see chart). You could transfer just enough to avoid being bumped into paying the 28% rate, and you'll likely avoid the 3.8% NII surtax, too. You might use that technique each year for a gradual Roth conversion that doesn't inflate your tax bill to a painful degree. Just keep in mind that the conversion math will be different for everyone. We can help you decide the best way to proceed in your situation.